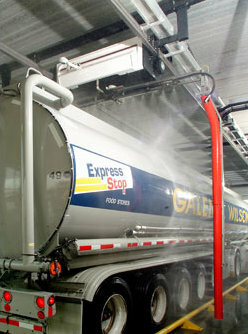 The V-Max® is Belanger's state-of-the-art touch free automatic large vehicle wash system. 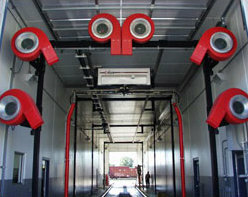 This overhead gantry system delivers unmatched performance reliability and superior cleaning results, all with minimal maintenance requirements. 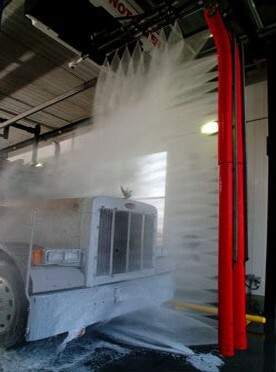 Available in three system configurations, the V-Max can easily provide a quality touch free wash to both a 30 foot dump truck or a 75 foot tractor trailer and everything in-between in as little as 3-6 minutes. The V-Max is the only large vehicle wash system that lets you program up to four different wash package options at one time. So whether you are using the V-Max to help maintain your own fleet's appearance and longevity, or you will be adding a Point of Purchase (POS) interface and opening a retail large vehicle wash facility, the V-Max will provide the exact wash options you need to succeed. In fact with the V-Max's E-300 program interface washes can also be managed off-site via the Internet so you can track frequency of washes and types of washes selected. The V-Max is designed with state-of-the-art technology including sonic vehicle sizing and greased-for-life bearings. Add in Belanger's standard equipment features such as aircraft-grade aluminum and high-density plastics and it is easy to see why the V-Max provides unprecedented ease of use and life-cycle reliability.